Last week Friday was International Women's Day to coincide with the occasion Prime Minister Peter O'Neill announced he would bring to Parliament a proposal to introduce four regional reserved seats for women. It was “only fair” that there is more debate about women’s role “at the leadership level”. There are currently 111 Members of Parliament in Papua New Guinea, representing 8.3 million people and not a single woman MP" O'Neill is reported saying. O’Neill said it was a “sad fact” that women’s interests were neglected. So is O'Neill genuinely concerned about women's interests? 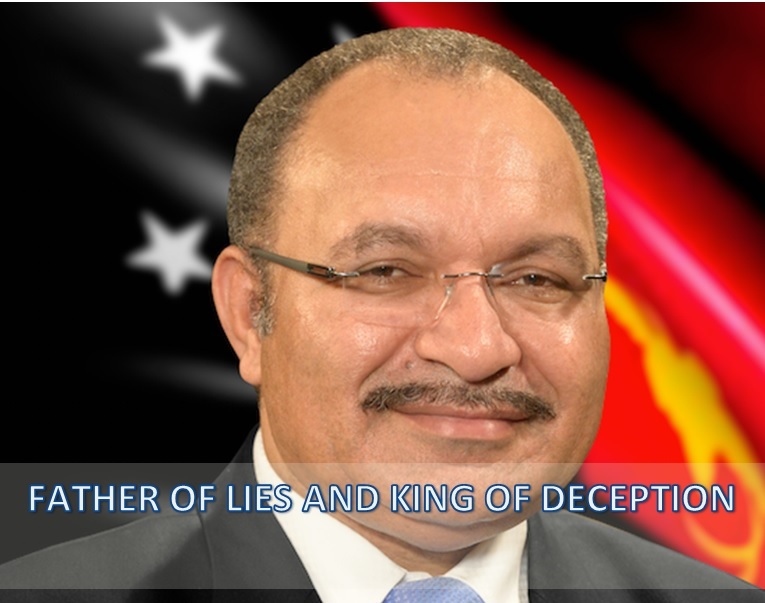 He is perhaps the most hated person in PNG, so it obvious his announcement was nothing but a publicity stunt in a desperate effort to gain public support. O'Neill has a record for saying anything with absolutely no intention of honoring it. Soon after illegally occupying the Prime Minister seat in 2011 he announced his Government had set up Task Force Sweep to deal with corruption. In 2014 he disbanded it after they uncovered he was involved in high level corruption. In 2013 O'Neill announced he would establish ICAC and implement it in 2014. On numerous occasions he has repeated the same statement. Why? Well he learnt his lesson from Task Sweep. However it doesn't stop him unashamedly keep making misleading public statements suggesting he is committed to fighting corruption. In August 2018 O’Neill visited Manam Island soon after it erupted and committed K3 million to provide food to the hundreds of islanders who were displaced, gardens destroyed and water sources contaminated from the heavy volcanic ash fall. When he arrived on the island the people arranged a feast with what little food they had - they all cheered after O'Neill announced he would urgently make available K3 million to assist them. It has been 6 months and O'Neill has yet to honor his commitment, nothing like misleading people in a desperate situation. There will be no proposed legislation to introduce reserved seats for women for the simple fact O'Neill can not afford to table any proposed law that would divide his Government on the eve of a vote of no confidence. It is the same reason why he won't introduce Foreign Investment Regulatory Authority Bill. Its my view O'Neill is a special kind of person, one that demonstrates traits of sociopathic/narcissistic and pathological liar. Liars, often sociopaths, are known to “study” the person they hope to take advantage of. In other words, they look for weaknesses. The liar does not have any moral consciousness of how the lying behavior may make you feel. The liar does not think before he lies. The liar does not care anything about your feelings and never will. The liar lacks the ability to consider what you might feel in response to their lie (which is empathy). 3) A pathological liar shows no emotion when lying which makes them believable; You will rarely if ever see emotion. Some really experienced liars are good at giving you direct eye contact, seeming relaxed or “laid back,” and may appear very sociable. The thing to look for is eye contact that feels piercing. Some sociopaths have learned how to evade people with direct eye contact, sociable smiles, and humor. The liar tends to manipulate more than anyone else and has learned how to become a “pro” at doing it. There is nothing impressive about the dangerous or evil manipulator. They know everything to say and do, they know what you want and don’t want, and again, they will “study” you. Some research suggests that pathological liars show no discomfort when caught lying, while other studies suggest that liars may become aggressive and angry when caught. The bottom line is that no pathological liar is the same. "Research continues in trying to understand the mind and behavior of the pathological liar. Psychiatrists and mental health professionals continue to research the liar in order to understand why they do what they do and how we can protect their victims." In the context of PNG the victims would be stupid people, both educated and Members of Parliament. Narcissists and sociopaths also cry a lot to get a person to do what they want out of pity. For example when the Supreme Court ruled that O'Neill's election as Prime Minister during the 2011 impasse was unconstitutional - O'Neill was so concerned Belden Namah would vote against him he borke down in tears begging Namah to re-elect him as Prime Minister. O'Neill has on a few occasions in the past cried in front Patrick Pruatich. O'Neill cried in front of Peter Ipatas in an effort to get him to join PNC. Unfortunately all three were misled and used by O'Neill. Some sociopaths are really, really good at their performances that their tears might be real, it’s just that they’re probably not crying for the reason you think or want to believe. As I have explained time and time again in the past, it is not that O'Neill is smart is it just whether you are dumb enough to believe him.